Bubbles and Blossoms: The McGaugh Family Blog: Easter Bunny Day!! 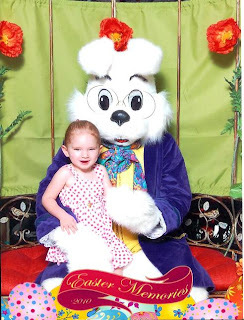 This morning I surprised Katie with a trip to see our friend the Easter Bunny! Ever since we decorated our house for Easter/spring, she has been asking about him, remembering from last year how much she loved meeting him. He officially started sitting at our mall on Friday, so I thought it would be fun to take her today. When we got there, we didn't have a line, and as soon as I took her out of the stroller, she made a beeline for the Easter Bunny. Sitting on his lap, she wanted to hold his hand, and she would lean back periodically and give him kisses. We took pictures, and she hugged him a few times. After we were done, he gave her a strawberry lollipop---which she enjoyed and which she loved to talk about, "He gave me a lollipop, Mommy!" Afterwards, we had a mommy-daughter lunch date at Costco to share a slice of pizza and sip berry smoothies (one of her favorite meals). This was taken right before we left for the mall... She was very excited!